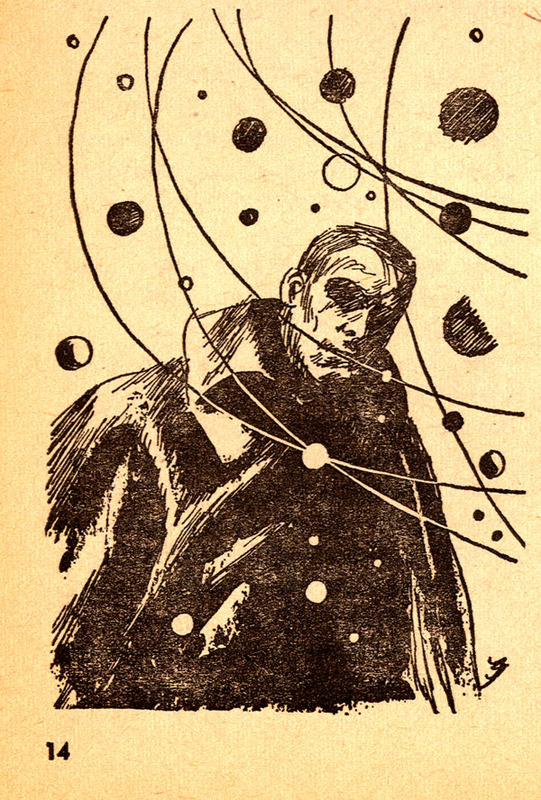 Jack Gaughan (1930-1985), was a celebrated and prolific artist of science fiction. 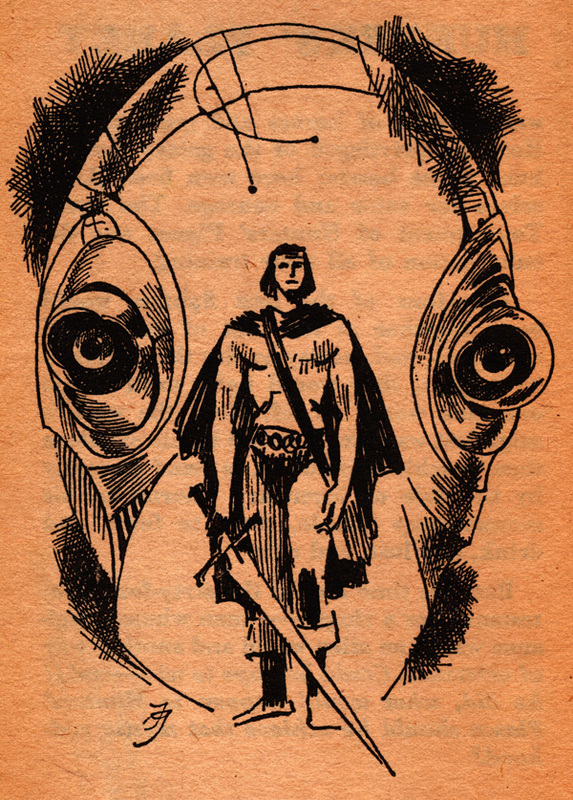 His work graced the covers and interiors of scores of SF books and magazines, and he was the recipient of several Hugo Awards, for Fan Artist (1967, and 1951 [awarded retrospectively in 2001]) and Professional Artist (1967, 1968, 1969). 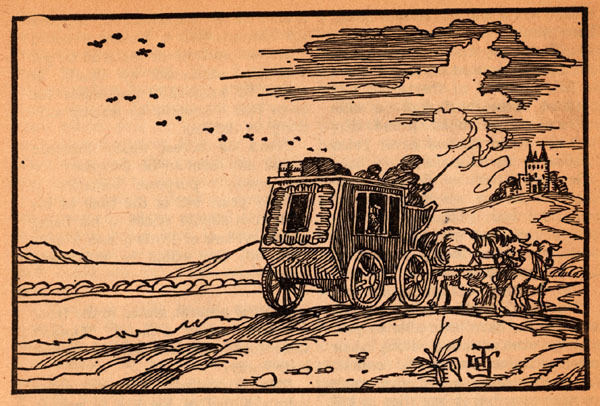 In addition to professional training at the Dayton Art Institute, he received personal tutoring from famed fantasy and science fiction illustrator Hannes Bok. 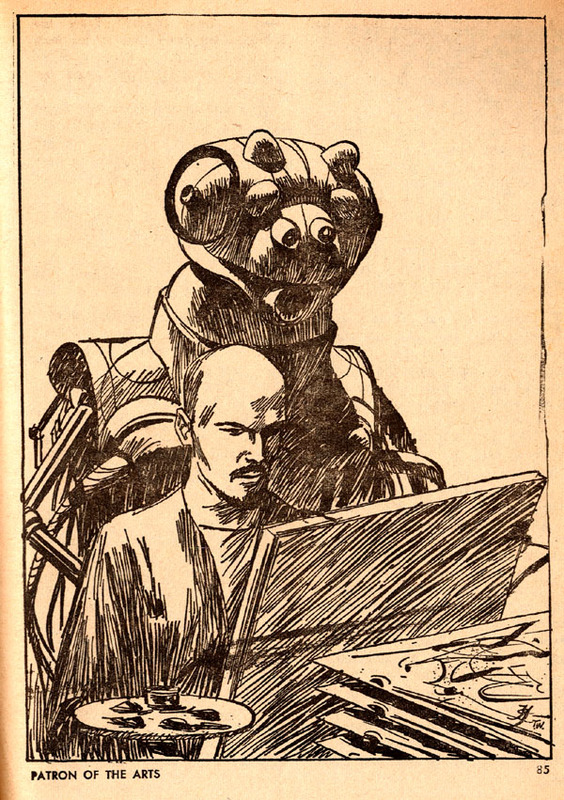 He was a fan and student of science fiction for most of his life. 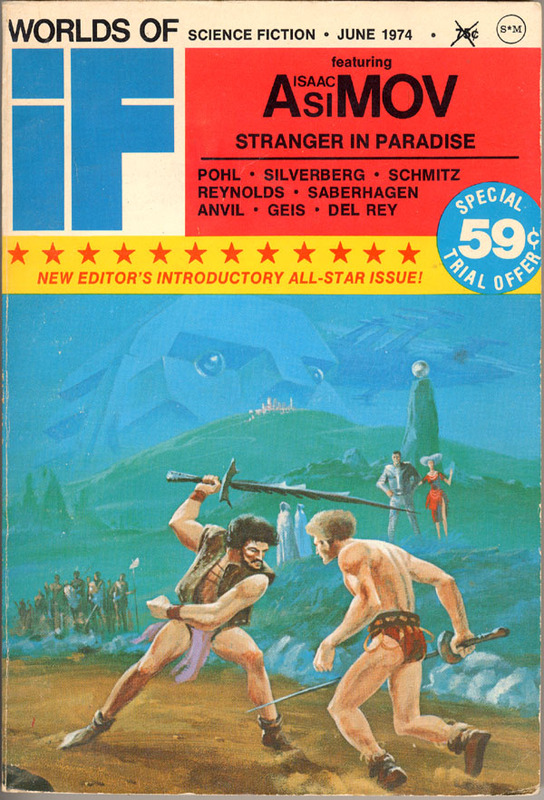 Many of the Berserker short stories made their first appearances in the likes of IF and Galaxy magazines. 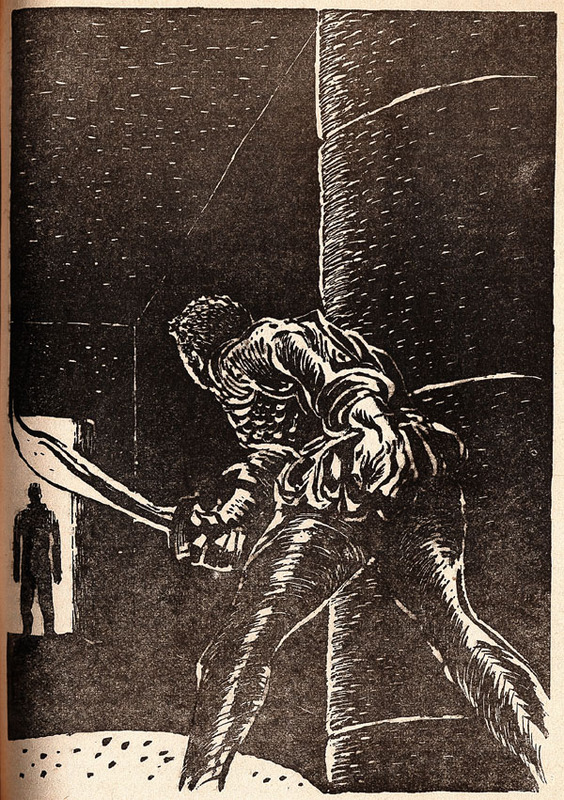 These were sometimes illustrated, and often featured Gaughan's artwork. I have received exclusive permission from Phoebe Gaughan, Jack's wife, to reproduce his Berserker illustrations here on the Taj. "Jack was a great fan of Fred Saberhagen," she said, "and I am sure he would be pleased to be included in your ambitious effort." Inquiries about Jack's work may be directed to Phoebe's email address. 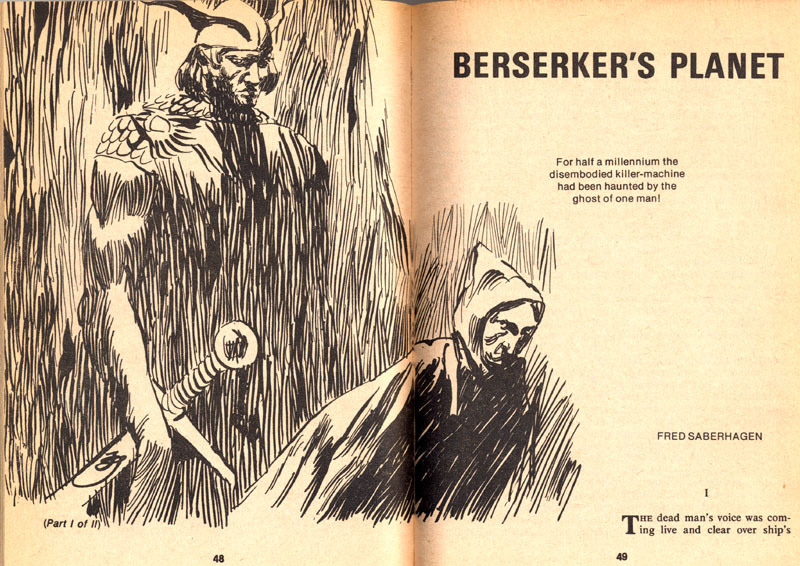 Using my Carmpan-like ability to reach out and collect vital bits of culture and information, I have managed to get a hold of all of the vintage magazine appearances of Berserker stories, and have compiled here all of the illustrations by Jack Gaughan that I could find. 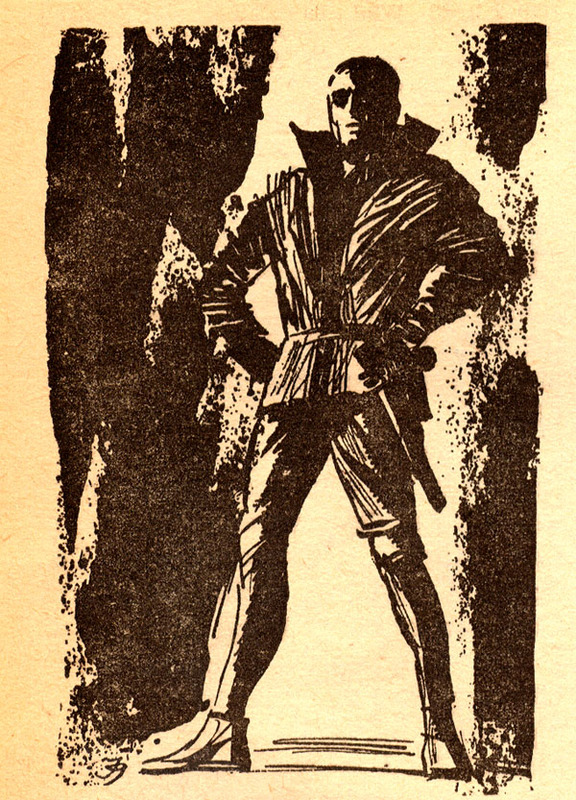 Please note that these images are copyright Jack Gaughan and may not be reproduced without permission. Guaghan also did the cover artwork and an interior illustration for the Daw paperback version of Berserker's Planet. Scroll to the bottom to see those, or just click here. IF, March 1965. Stone Place. Stone Place. 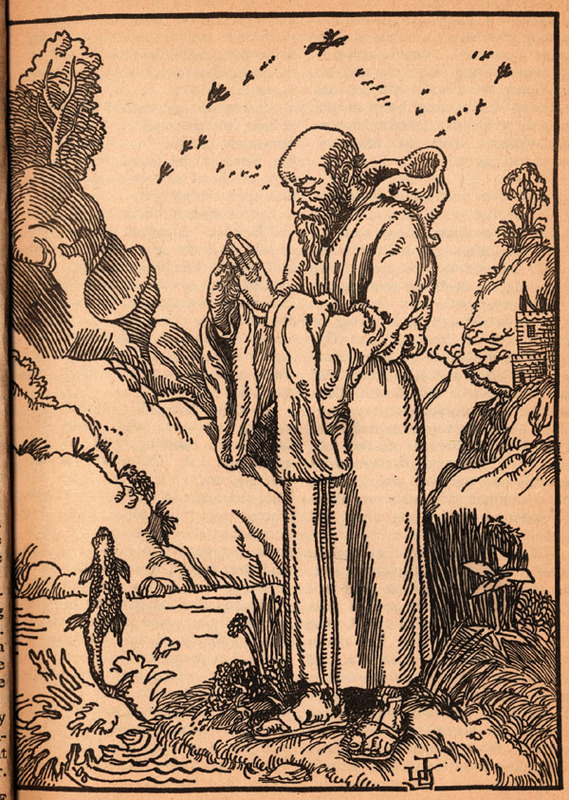 Quite possibly the legendary Johann Karlsen, warrior saint. Stone Place. 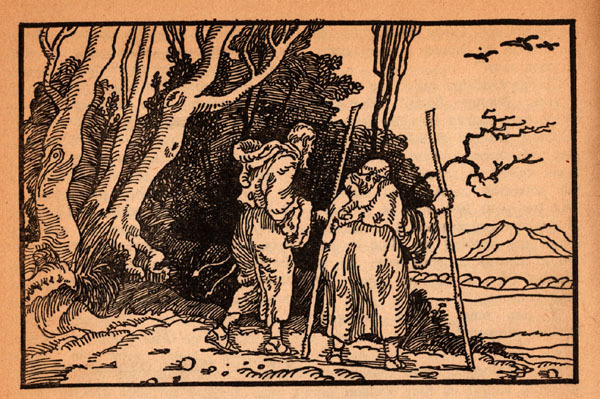 Possibly an illustration of a Carmpan! Stone Place. Close combat between Solarians and Berserkers! Stone Place. Karlsen again perhaps. IF, August 1965. Patron of the Arts. Piers Herron, master artist, paints an interpretive portait of a Berserker unit as his subject looks on. IF, November 1965. Masque of the Red Shift. 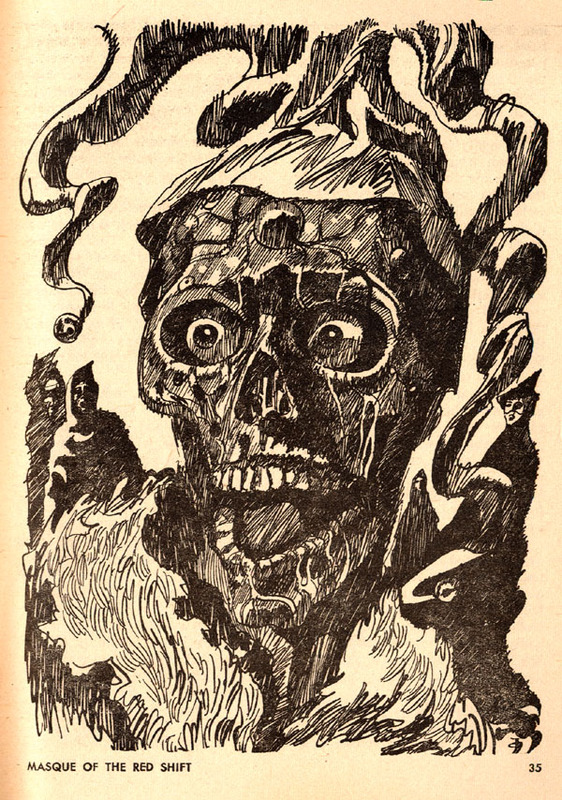 "...the whole lifeless mask fell red and wet from around the staring eyes, and his steel berserker-skull grinned out. Masque of the Red Shift. 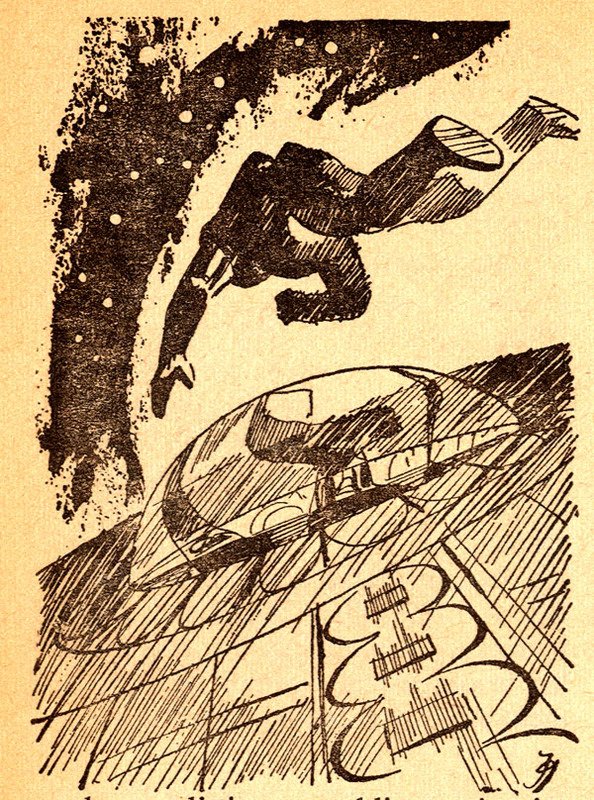 IF, January 1966. Mr. Jester. 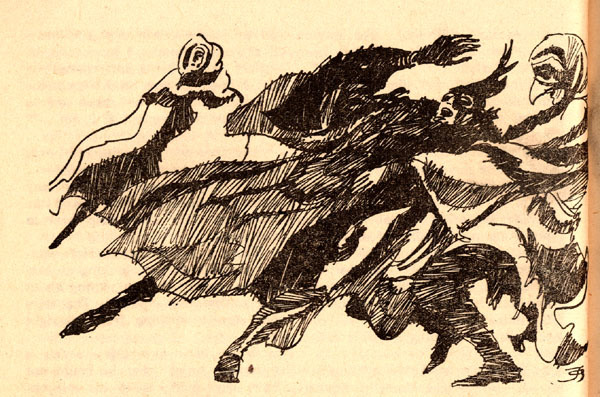 "Men had forgotten laughter... and the Berserkers had never known it!" IF, April 1966. In The Temple of Mars. "And downward, at the bottom of a hill; Stood the temple of Mars who is mighty in arms..."
In The Temple of Mars. IF, November 1967. Brother Berserker. Brother Berserker. "Jovann looked down at this watery uproar in distress. 'Be still now, Brother Fish. Enough!'" 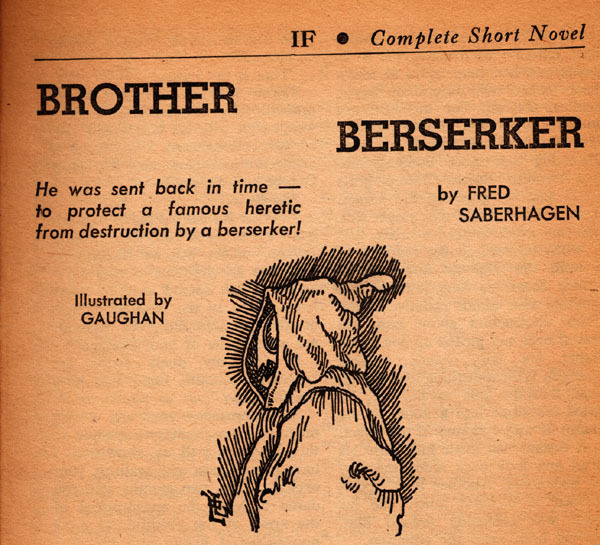 Brother Berserker. 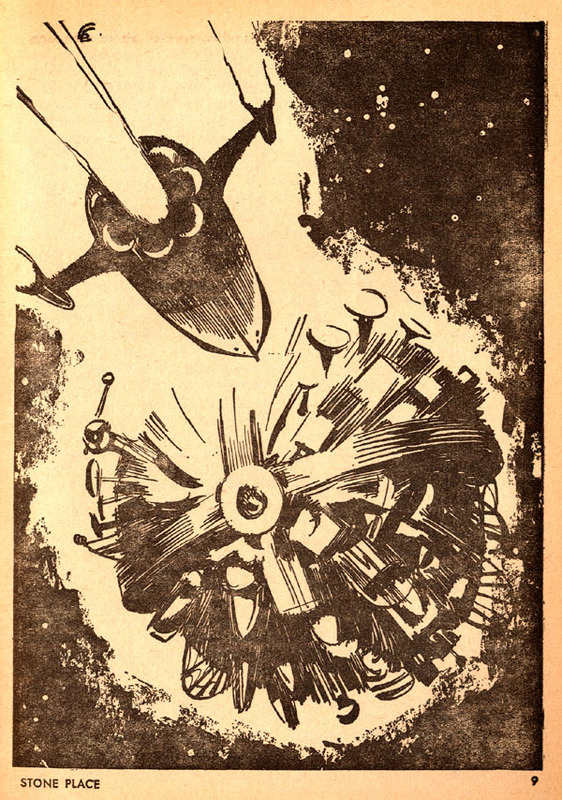 "The most complex and compact machine the berserkers ever built, shot up through twenty thousand years evolutionary gradient..."
IF, April 1974. Wings Out of Shadow. 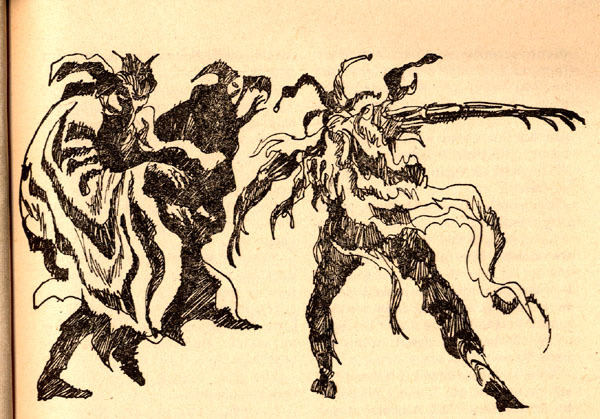 "...each human must live the combat through in terms of a unique nightmare." IF, June 1974. 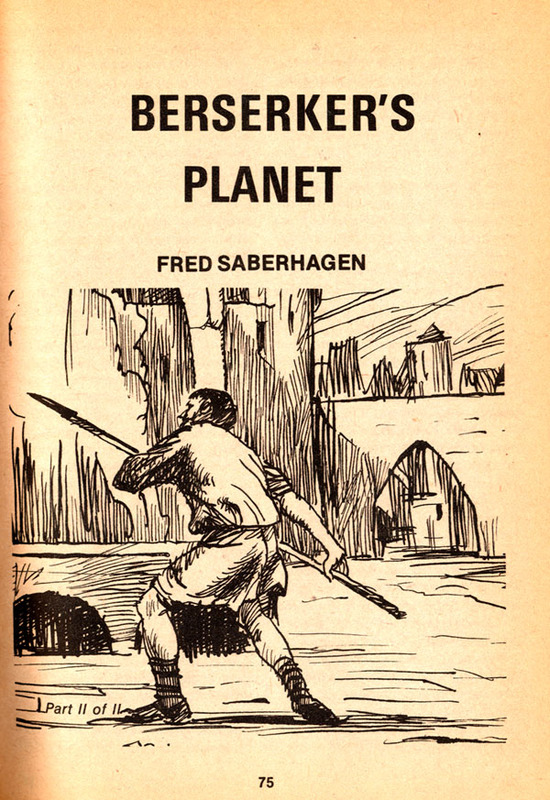 Cover for Berserker's Planet (serialization, 1 of 2). 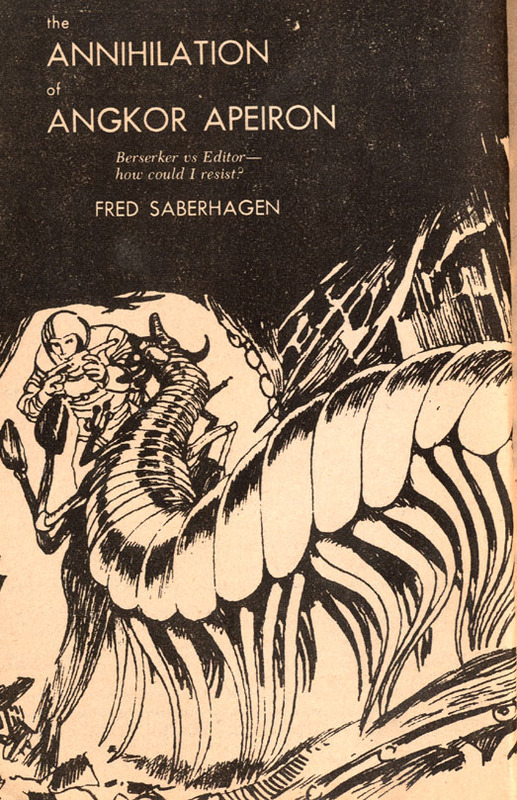 Berserker's Planet (serialization, 1 of 2). 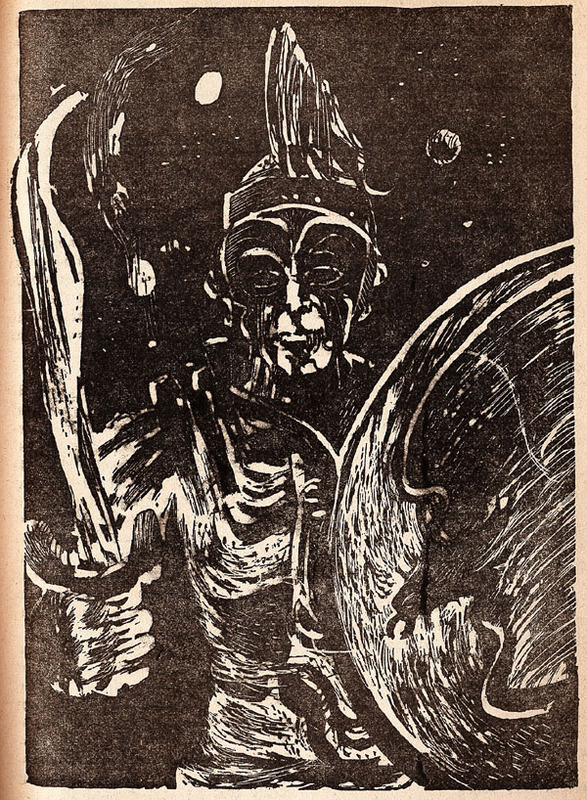 IF, August 1974, Berserker's Planet (serialization 2 of 2). "Backing and circling, Thomas knew that he must now plan and fight the finest battle of his life." Galaxy, February 1975. The Annihilation of Angkor Apeiron. 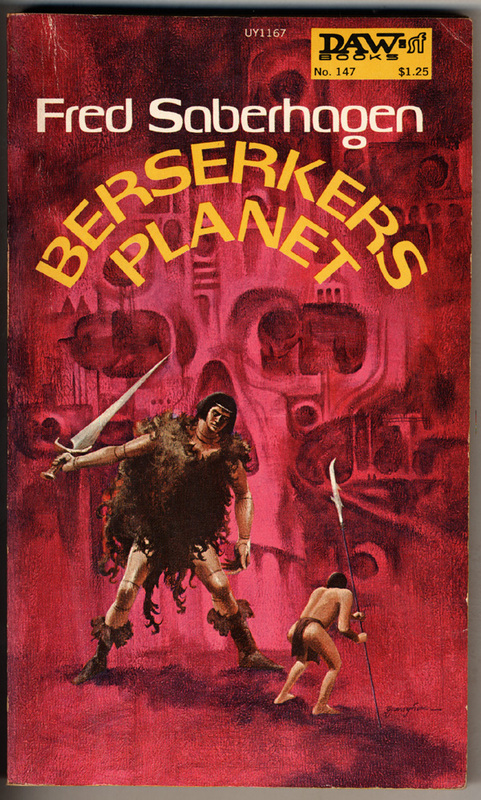 Berserker's Planet (Daw, 1975), cover. 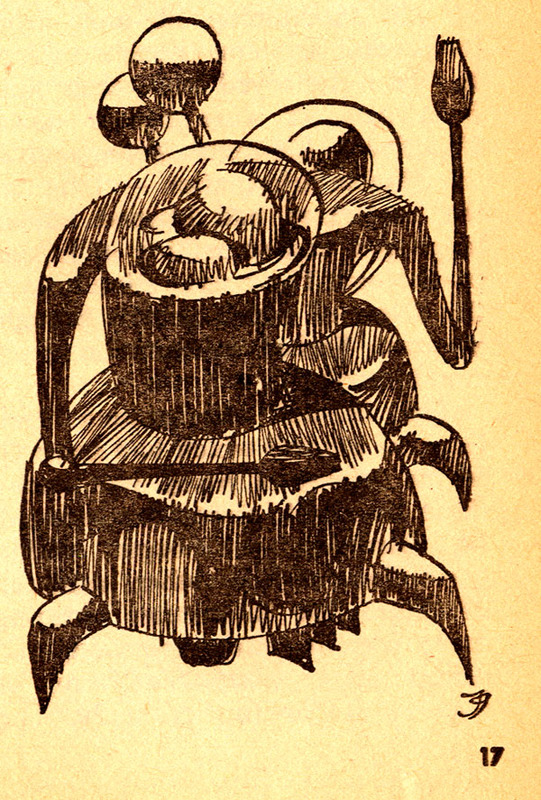 Berserker's Planet (Daw, 1975), interior illustration.